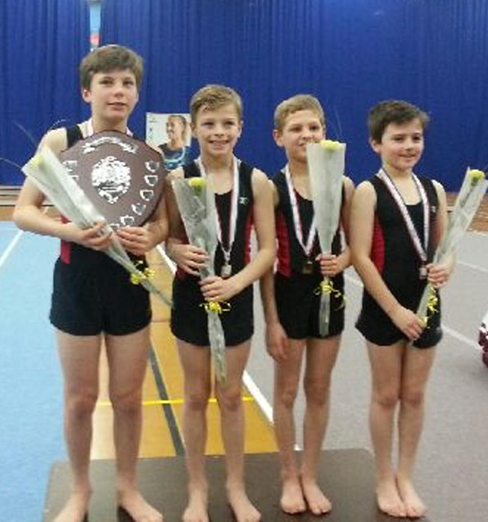 The U11 boys from Chalfont St Peter shone in the British School Gymnastics Team Finals. The team produced a polished performance to win the title for the eleventh time on Saturday at Stoke on Trent. The team comprising four boys, Alex Bower, Ben Howman, Charlie Walsh and Oliver Evans with reserve Callum Kavanagh, performed their vaults, individual floor sequences and a group sequence with great panache to out perform the other nine teams from across Great Britain. Chalfont St Peter won by 0.4 points, ousting the West Midlands and north east teams into second and third place respectively. Coach, John Underwood, praised the boys for their outstanding character and teamwork. Further he paid tribute to their parents and families for their enthusiastic support and encouragement.